Karissa Noselski, resident of Sylvan Lake, recently returned from an water projects internship in Cambodia with Samaritan's Purse. Searching for something to do after graduating from university, a Sylvan Lake resident found an interesting opportunity in Cambodia. An opportunity which she described as “definitely a culture shock” but something that has also helped her not only learn about the rest of the world but about herself. It also enhanced her love of travelling. Karissa Noselski has just returned from seven months in the southeast Asian country which is bordered by Thailand, Laos and Vietnam. She worked on water projects as an intern with Samaritan’s Purse which partners with Clear Cambodia. The internship was sponsored by Canada’s Department of Foreign Affairs, Trade and Development. “It’s amazing to see how different people live,” she said. Among her favourite experiences were those that involved working with the people and experiencing their lifestyle. “They live very simply, it’s a beautiful country, a change of pace,” Noselski said. Dirty water is poured into the concrete filter, flowing through sand and gravel. Organic material, parasites, micro-organisms and viruses are trapped in a biological layer that effectively removes these disease agents. The water which comes out the spout is free from pathogens, odour and cloudiness. Each filter can produce 40 litres of clean water per hour and the filters can last for decades because there are no moving parts and no power supply is needed, according to information from Samaritan’s Purse. Based out of Cambodia’s capital, Phnom Penh, she and five other interns travelled to six different provinces. “I got to see how the whole program works. My project specifically was a behaviour change project.” After being introduced to the project, she was challenged to make it more exciting and efficient. One of her goals was changing behaviour so that the people weren’t just focused on water filters but also on washing hands with soap, using the latrine, understanding the importance of water health, hygiene and sanitation. The people who received these filters were extremely grateful and so happy that there was someone out there willing to help improve living conditions in their country, Noselski indicated. “I will never forget the time I went back for a three month visit to someone’s home who I had met when they signed up for the program. They said to me, “you helped us … thank you.” Many people want to give us fresh fruit off their trees to show their gratitude. In some cases, we could tell simply by the smile on their face and their appreciation that for many people, this program has helped to save lives. 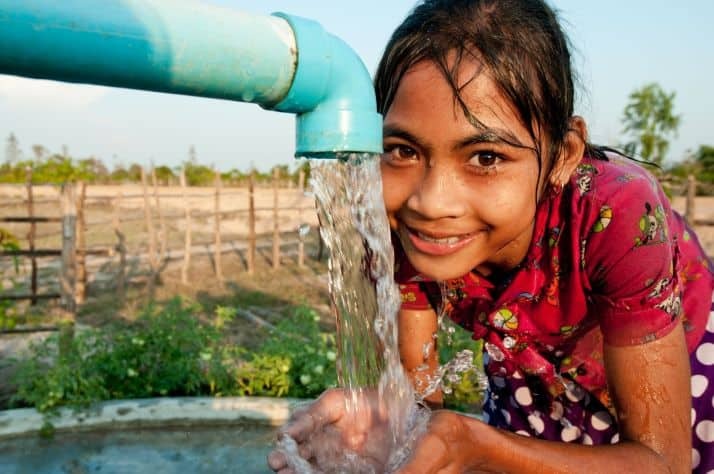 “Although I played a very small part of the incredible work they do at Samaritan’s Purse and Clear Cambodia, it is so wonderful to see both local people and NGOs helping others to provide some of the basic needs like clean water-something that should be a human right, yet approximately half the developing world’s population (over one billion people) still lives without it. “For many people, this filter means hope for the future. Clean water helps these families live healthy and happy lives, where they no longer have to worry about their family getting sick from dirty water. Noselski earned a Bachelor of Community Design degree from the University of Dalhousie in Halifax in May, 2012 with a double major in Urban Design Studies and Sustainability. While she grew up in Airdrie and headed to university when her parents moved to Sylvan Lake, she spent a couple of summers here working at Lakewood Golf Club, and considers the community her home. She described her future as “limitless”.